The five-year survival rate for stage 0 breast cancer is very close to 100%. This means that almost all women diagnosed with stage 0 disease will live for at least five years after being diagnosed. In fact, women diagnosed with stage 0 breast cancer are generally able to live healthy and have a long lifespan. However, stage 0 breast cancer is difficult to diagnose, so routine mammograms and self-examinations are necessary to detect early stage 0 breast cancer. Stage 0, also called carcinoma in situ, is the earliest stage of breast cancer. This very early breast cancer stage is sometimes interpreted as a precancerous condition. Many stage 0 breast cancers do not require treatment. When they do, the approach is generally very successful. Ductal carcinoma in situ (DCIS) is the most common type of non-invasive breast cancer..“Ductal” means that the cancer starts inside the milk ducts, carcinoma refers to any cancer that begins in the skin or other tissues (including breast tissue) that cover or line the internal organs, and “in situ” means "in its original place. " DCIS is called "non-invasive" because it hasn’t spread beyond the milk duct into any normal surrounding breast tissue. DCIS isn’t life-threatening, but having DCIS can increase the risk of developing an invasive breast cancer later on. 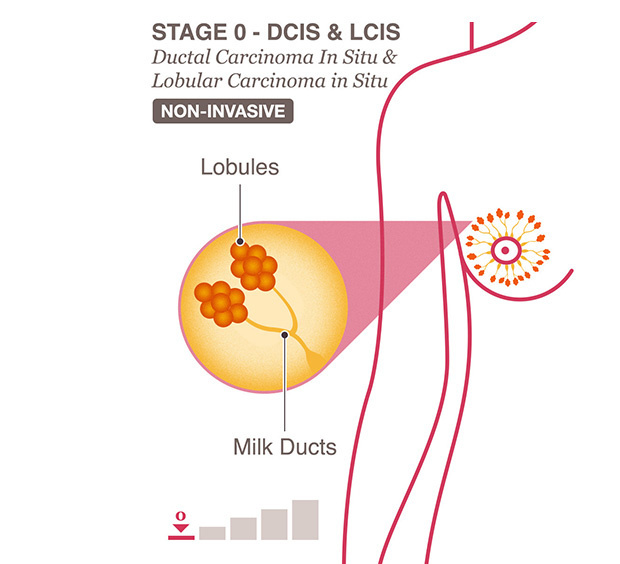 Lobular carcinoma in situ (LCIS) at Stage 0 generally is not considered cancer. Although it has carcinoma in the name, it really describes a growth of abnormal but non-invasive cells forming in the lobules. Some experts prefer the name lobular neoplasia for this reason because it accurately refers to the abnormal cells without naming them as cancer. LCIS, however, may indicate a woman has an increased risk of developing breast cancer. Many stage 0 breast cancers do not require treatment. When they do, the approach is generally very successful. Surgery is one of the common methods of breast cancer treatment. For smaller DCIS tumors, you might get a lumpectomy, in which the abnormal cells and some breast tissue are removed. Some women decide to have a mastectomy, in which the breast is removed. After a mastectomy, you might choose to have breast reconstruction surgery. If you do not want to undergo surgery, you can choose other treatment techniques, as follows. Green chemotherapy is a new type of chemotherapy that differs from traditional intravenous chemotherapy. Intravenous chemotherapy may cause more side effects. By contrast, green chemotherapy, which is based on the body's biological clock, injects anticancer drugs during cancer cells active period, which can effectively improve the drug's effect and bring less side effects, because in this period, the cancer cells are relatively active and the normal cell is relatively inactive.